Little Poems for Big Hearts is a book of poems to fill your heart and lift your spirits. Short and sweet, yet generous in their messages of kindness and strength, the poems in this book will give you a hearty dose of self-compassion and courage. Camille wrote these poems for herself during a time of depression, and they wound up being her lifeline on the way to happiness. Now, paired with journaling prompts to inspire reflection, she’s sharing them with you. With accompanying beautiful watercolor images, this book will inspire and uplift you again and again. Keep it by your bedside or on your coffee table, or give it as a gift to someone you care about. Do you need help telling your story? Do you have a story inside, but you’re not sure how to tell it… or if it’s even worth telling? Do you have a tiny little voice inside telling you to write… but you’re not sure you can? Do you want to tell better, more authentic stories… but you’re not sure where to start? You’re not alone. Camille created this workbook just for you. Discover the stories you have to tell. Turn your personal experiences into signature stories. Become confident writing, talking about, and sharing your story. 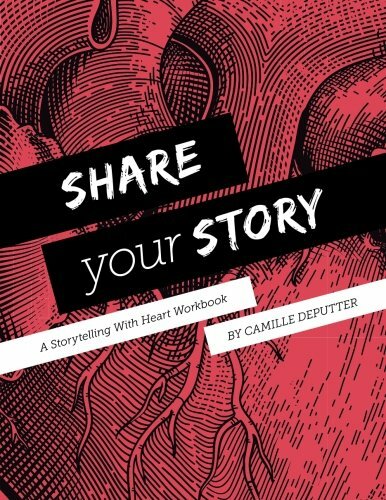 The Share Your Story workbook is your personal storytelling guide. A professional storyteller and communications expert, Camille knows that your story is worth telling, and sharing. In this heartfelt book, she walks you through a practical and simple road map to help you uncover and write your personal stories. Unique writing projects that will help you turn your personal experiences into stories. A method for working through past hurts and painful subjects in a safe and positive way. Fun, easy writing activities and questions to help you think about your own stories in new, creative, and uplifting new ways. A guide to developing your own signature story. This is your chance to tell your story, your way. Get started today. Just like everyone on this planet I had a story inside me that was yearning to be set free. The only problem was I had no idea how to open up and share it. Camille has a superb ability to show you how to tap into the power of your story and to tell it in a way that is engaging, fun, and bursting with ‘your essence’.